Title: "CANYON ROAD FENCE" Fine Art Print Image Size: 14" x 11" Paper Size: 19" x 13" Price: $99.00 FREE Shipping in Continental U.S. Packed, Insured and Shipped in sturdy Fine Art Mailing Tube. No exchanges, returns or refunds. In event of loss or damage in transit, Purchaser must contact Seller within 7 days of delivery for replacement of identical item. *Please allow 3 -4 weeks from date of purchase for delivery. 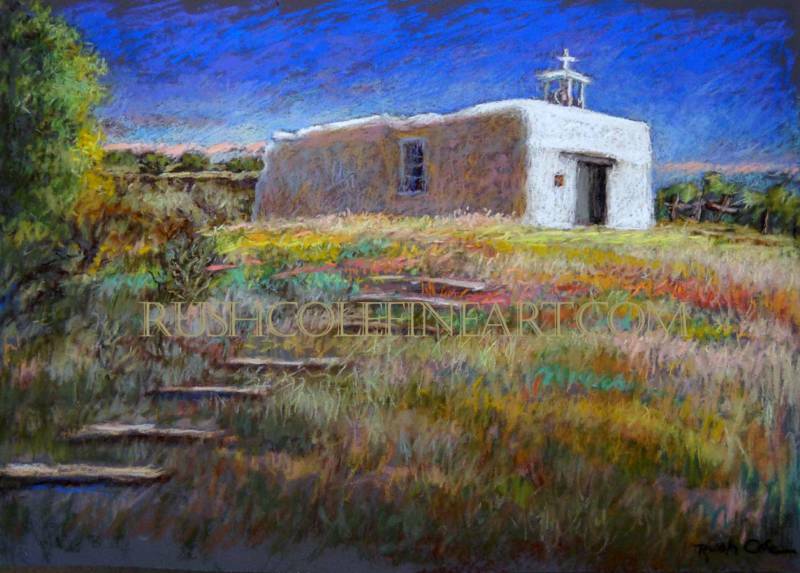 "LA CAPILLA DE SAN ANTONIO" Fine Art Print Image Size: 10.5" x 14.5" Paper Size: 13" x 19" Price: $99.00 FREE Shipping in Continental U.S. Packed, Insured and Shipped in sturdy Fine Art Mailing Tube. No exchanges, returns or refunds. In event of loss or damage in transit, Purchaser must contact Seller within 7 days of delivery for replacement of identical item. *Please allow 2 - 3 weeks from date of purchase for delivery.